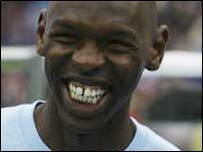 Reading have finally clinched the £500,000 signing of Manchester City veteran Shaun Goater. Royals boss Alan Pardew has been chasing the Manchester City striker since failing to agree terms with Wimbledon striker David Connolly. Connolly has joined West Ham - leaving Reading to snap up the 33-year-old Bermudan international. He signed a three-year contract after passing a medical and a Reading spokesman said: "A signing of a player of this calibre signals our intentions." Reading boss Pardew said: "We need players of quality to take us to the next level." With Nottingham Forest, Sheffield United, Sunderland and Wigan also keen to sign Goater, the striker explained why he had chosen Reading. "If I had to single out one reason why I joined Reading it would be because the manager told me he could improve my game," said Goater. "I know what it takes to get out of the First Division and I have played 36 times for my country but I always look to the future and Alan Pardew convinced me that I can still learn. "Although my family was happily settled in Manchester we now plan to move down to Reading, even though I don't know that much about the area." Goater began his career in England with Manchester United in 1989 but lasted just five months at Old Trafford before joining Rotherham on a free transfer. After a loan spell with Notts County he then joined Bristol City for £175,000 in 1996 and moved to Manchester City for £400,000 in March 1998, where he enjoyed the best football of his career. At Maine Road Goater scored 85 league goals in 187 appearances, helping City out of the doldrums and lifting them from Division Two to the Premiership. He will be charged with the task of firing Reading into the top flight next season, with the Royals only narrowly missing out earlier this year when they lost in the First Division play-off semi-finals.